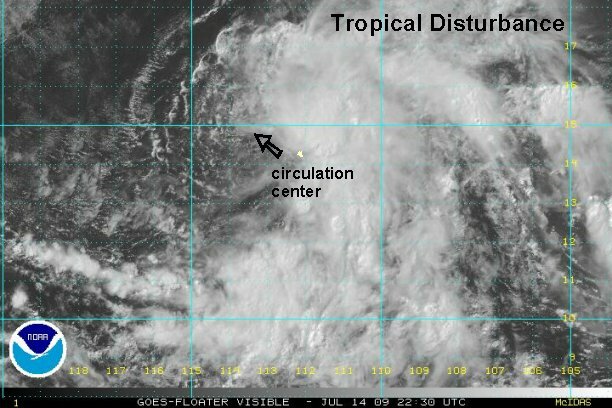 It looks like our latest tropical depresison has formed. 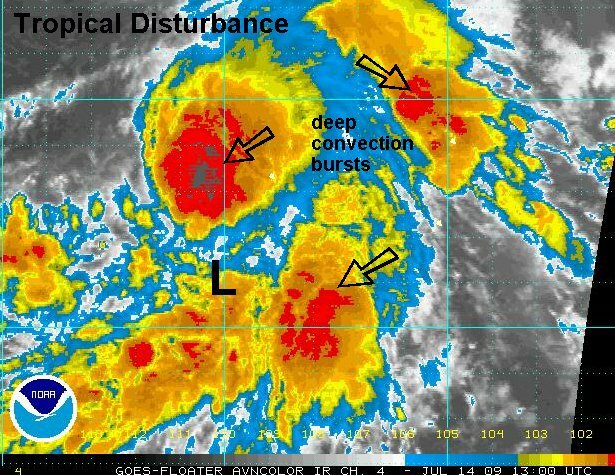 It is interesting to note that the convection envelope is about ten times bigger than hurricane Carlos! This doesn't mean that it will be ten times stronger though of course. Quickscat satellite showed a closed low on the last pass near 11.0 N / 110.0 W or about 815 miles south of Cabo San Lucas. Motion is tough to estimate in the chaotic convection. Forecast models develop it and take it west northwest, then northwest. It does not look to be a threat to western Mexico. A weak surface low is still apparent near 13.8 N / 113.6 W or about 670 miles south of Cabo San Lucas. It is moving west at about 12 mph. Deep convection is mostly east of the center of circulation and has not wrapped or built near the center of circulation yet. There is still potential for development with this system as it moves away from the Mexican coast. Tropical depression 5 - e is centered near 13.8 N / 113.8 W or about 680 miles south southwest of Cabo San Lucas. It is moving west northwest at about 10 mph. *** update for td classification*** See earlier discussion. Tropical depression 5 - e ( or really tropical storm Dolores ) is centered near 15.7 N / 114.5 W or about 570 miles southwest of Cabo San Lucas. It is moving northwest at about 12 mph. 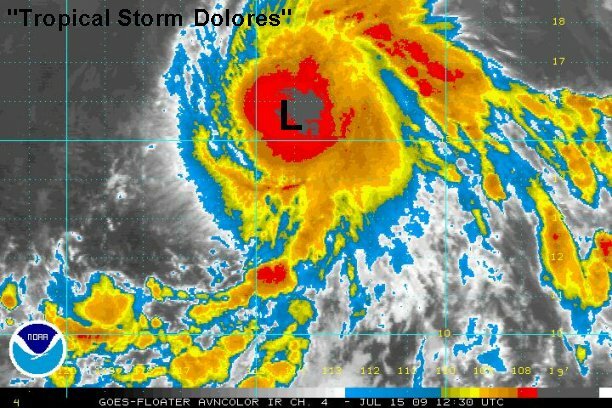 Officially Dolores is at 35 mph. We think that it is much stronger and are going to estimate 60 mph. 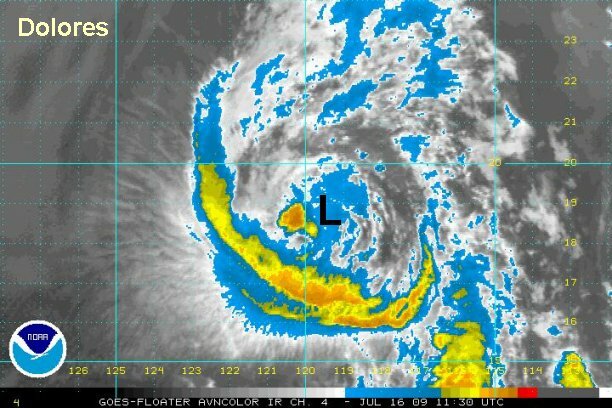 There is a very deep convection burst and well defined spin noted on the I.R. imagery. We are positive that NHC will name this thing next advisory and adjust the speed up too. It is well west of Cabo and not a worry. It is also plowing toward colder water so this development won't continue too long! 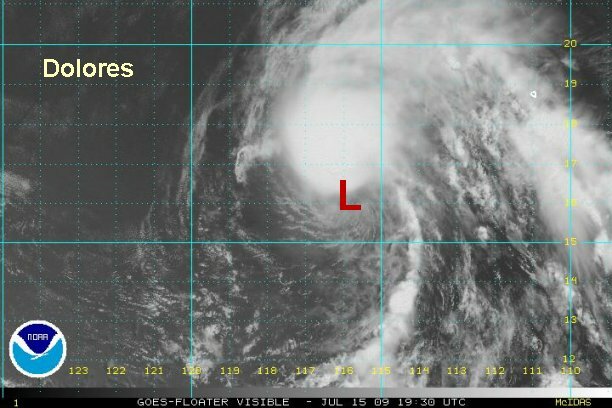 NHC officially named Dolores for the 8 am pdt advisory with 40 mph winds. We still think it's stronger, per our last update. Tropical storm Dolores is centered near 16.2 N / 116.2 W or about 610 miles southwest of Cabo San Lucas. It is moving west northwest at about 12 mph. Southerly wind shear has exposed the center of circulation. We are now estimating 50 mph as the deep convection has now been displaced northward. Tropical storm Dolores is centered near 18.6 N / 119.6 W or about 690 miles southwest of Cabo San Lucas. It is moving northwest at about 18 mph. Top sustained winds are officially 50 mph. Convection has decreased markedly and we are estimating 40 mph which is closer to satellite estimates. Dolores is heading toward colder water still and will continue to weaken. 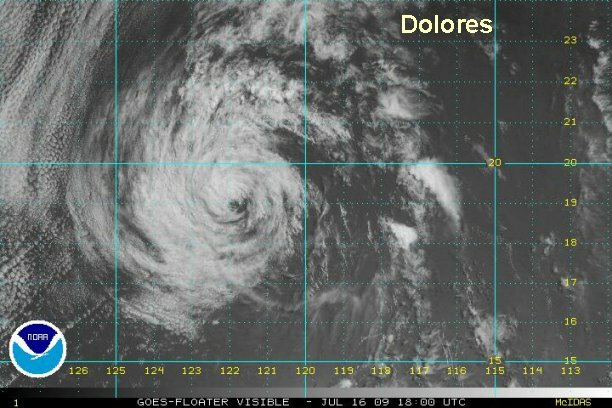 Dolores is centered near 19.0 N / 121.8 W or about 800 miles southwest of Cabo San Lucas. It has changed course slightly over the past few hours and is now moving west northwest at about 16 mph. Top sustained winds are officially 40 mph. We estimate that Dolores is now at 35 mph and should be a tropical depression. No convection remains near the circulation center. This will be the last update on Dolores unless regeneration occurs.